The Sicilian winery of Valle dell’Acate has a long history amongst the top estates in Sicily, as the Jacono family can trace back their winemaking roots here to the nineteenth century. It is located in the southeastern corner of Sicily, on the elegant Bidini Manor in the hills of the Dirillo Valley. The estate comprises over one hundred hectares of land, both for grapevines as well as Sicily’s famous blood oranges. Under the direction of the current head of the family winery, Gaetana Jacono, many of the vineyards have been replanted to the great traditional grapes of Sicily which are farmed organically. The estate produces one of the finest examples of Cerasuolo di Vittoria, traditionally Sicily’s greatest wine. Cerasuolo di Vittoria was the first red wine in all of Sicily to achieve DOCG status, and to this day it continues to be one of Sicily’s greatest reds. Valle dell’Acate also makes a great many IGT bottlings from their well-tended vineyards, including Il Nero, Zagra, Il Frappato and Tané. All of the bottlings from Valle dell’Acate must be ranked amongst Sicily’s finest. This wine was produced entirely from Frappato grapes from Eastern Sicily. It was aged 6 months in steel tanks, then 3 months in bottle. 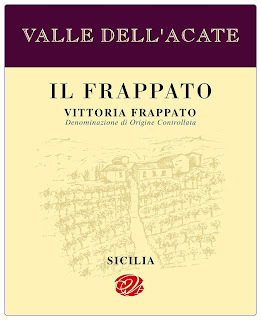 2007 Valle dell'Acate "Il Frappato" has a very clear robe and light hue. It boasts aromas of wild red and dark berries mix with floral, spicy notes on the nose. The palate offers ripe cherry and black berry fruit flavors with floral, earthy, spicy, slightly smoky notes. Light to medium bodied, with good juicy fruit in the mid-palate, this quite nice, somewhat, rustic wine has a great acidity and a fresh high tone red fruit attitude. It will make a perfect summer wine to have with appetizers. You could even chill it a bit.